Act responsibly and with respect at all times. Always keep your finger off the trigger and outside the trigger guard until you are ready to fire. Firearms may only be uncased or removed from the holster at the firing line. Load and unload all firearms at the bench in the shooting booth. Please notify a Range Safety Officer immediately if you observe any unsafe behavior or conditions. It is your responsibility to know and understand how to operate your firearm safely. You must ensure that your firearm is in good working order before entering the range. If you are unable to demonstrate safe firearm operation on the range, you may be asked to leave. All guests must listen and agree to the verbal safety briefing given by the Bristlecone Range Safety Officer at the counter before entering the range. All guests are required to sign a liability waiver (good for one year) before entering the range. Bristlecone Suicide Prevention Policy: First time, unaccompanied individuals will not be allowed to rent a firearm. Bristlecone Age Restrictions: Under 10 years old – not allowed on the range or in the Virtual Training Simulator. 10-17 years old – must be supervised by a parent or legal guardian, cannot rent firearms. 18-20 years old – may shoot, rent or purchase rifles and shotguns or shoot personally owned handguns without parent or legal guardian supervision. Cannot rent handguns. Must be 21 years old to shoot full auto firearms (rentals or personally owned), rent handguns and purchase handgun ammunition. 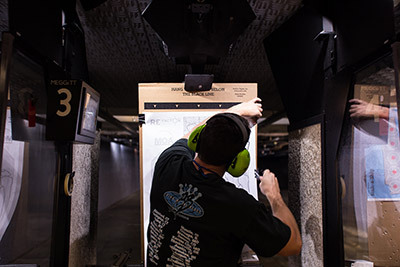 Fire only when safe conditions exist: all shooters must stand in their respective shooting booth and non-shooters must stand behind the booth area. The following types of ammunition are not permitted on the Bristlecone range because of the extensive damage they cause: steel ammo of any kind (including steel cased ammo), tracer ammo, incendiary ammo, or penetrating ammo of any kind. We have a zero-tolerance policy with regards to this damaging ammunition. If you are found with any of these ammunition types without prior notification to the Bristlecone Range Staff, you will be asked to leave. Pistols only in the 6-lane Standard Bay. No .50 cal. or any other high caliber handgun round such as 500 S&W Magnum, 50 Action Express, 480 Ruger, 460 S&W Magnum, 454 Casull, 45-70 (shot in the “BFP” pistol frame). Rifles and shotguns (slugs only) may be fired in the 8-lane Tactical Bay. Rifle rounds up to .30 caliber (.308/30-06/.300Win) or 7.62mm are allowed. All shooting must be conducted in a safe, controlled and accurate manner. All firearms (other than concealed carry, appropriately holstered by a CCW permit holder) must be transported in a case or bag to and from the range. 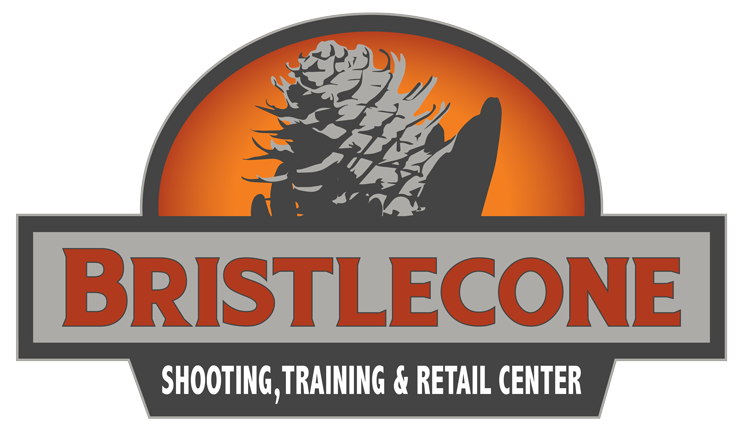 Guests and/or Members who would like to practice drawing from the holster must be “holster qualified” through a Bristlecone Range Safety Officer or Instructor. Bristlecone staff may restrict drawing from the holster at their discretion, even if a Guest or Member is “holster qualified”. Upon the command “CEASE FIRE”, stop all shooting immediately, put down your firearm and back away from the firing line. Guests and/or Members may not re-approach the firing line or pick up any firearm until a Bristlecone Range Safety Officer gives the “all clear” signal. Appropriate attire must be worn at all times inside the Bristlecone range. Appropriate attire includes but is not limited to closed toed shoes and crew neck or higher shirts. No low-cut shirts, flip flops/sandals or any apparel that interferes with the safe operation of firearms inside the range. Never consume alcohol or take drugs (including marijuana) before or while shooting. No food, drink, gum or any tobacco product is permitted inside the range. Always remember to wash your hands after you leave the range and prior to eating. After firearms are unloaded and cased, you may collect your brass from behind the firing line. Never cross the firing line for any reason. Do not attempt to retrieve anything (including targets) that falls in front of the firing line. If you need assistance, please signal a Bristlecone Range Safety Officer. Inappropriate behavior of any kind will not be tolerated. At their sole discretion, Bristlecone Range Safety Officers will remove any individual from the range who is deemed to be acting in an inappropriate or unsafe manner. Any violation of the Bristlecone Range Rules may result in immediate removal from the range and possible forfeiture of Membership.